If the task of the fantasy novel is to create an engaging new world and tell an absorbing story in it, then Neil Gaiman’s Neverwhere delivers the goods just fine. If it is do more than these, then Neverwhere comes up a bit short. Neverwhere is primarily the story of Richard Mayhew, a pleasant but vague financial analyst in the modern City of London (or “London Above”), and the Lady Door, a member of the aristocracy of “London Below” which is a realm of fantastical or historic persons and places below the city tied together by the London Underground. Richard finds Door lying injured on a city street and is soon drawn into her desperate attempt to flee the killers who murdered the rest of her family while simultaneously seeking to understand the reason why her family was murdered. Along the way, we’re introduced to a satisfying number of delights. These include the murderous Misters Croup and Vandemar, a Dickensian pair straight out of nightmare; the Floating Market where all the contending citizens of London Below gather under a general truce to plot, trade, and revel; a large group of colorful supporting players; and the angel Islington who is still mourning its failure to save the people of Atlantis from destruction. Gaiman’s invention is not endless, however. His plot has just enough twists to keep the story in pleasant motion. Gaiman often reaches for the word or phrase you’d expect, to the extent that I was often completing his sentences in my mind as he did on the page. His Angel Islington and Richard’s snobby rich girlfriend come straight from central casting. And at best, his characters have just enough distinct qualities to be sufficient for the story – which is to say they have two. So the young lady Door is waif-like yet resolute. The Marquis de Carabras is amoral but scrupulous in the paying of his debts. The Black Friars are kind but a touch sinister. Most particularly, and not successfully, Richard Mayhew is hapless and heroic. Mayhew is mostly paralyzed by fear and protected by the other characters out of pity, except for a few moments when he rises to a challenge that has defeated scores of men and women from London Below over the course of centuries. One challenge is the dread “ordeal” and the other is the great “Beast of London” which lurks in a labyrinth. Neither of these victories seems probable and Gaiman makes them less so by frequently playing Mayhew’s character for laughs. This gets at my two disappointments with Neverwhere, which I had expected to like better based on Neil Gaiman’s reputation. The first is that none of the characters were sufficiently developed that I could feel an emotion toward them and so feel that something was at stake while reading Neverwhere; and what should be at stake in reading is our hearts. Mine was never engaged. Secondly, what binds a fictional world together and makes it breathe, whether it is utterly fantastical or obsessively mundane, is its emotional tone: how the author feels about the world he or she has created. I don’t think Gaiman ever decided how he felt. Instead, he has the ha-ha mostly feckless Richard Mayhew stumbling around a story that is threatening and apocalyptic. This makes Neverwhere entertaining for sure. But it doesn’t make it anything more. Yes. Since I typically discuss what I like and what I don’t like in a book, and give attention to both in proportion, I sometimes think my overall positive reviews can feel negative. I might be a tough reader for fantasy novels, however. I expect a fair amount from an author. Please put this book aside for me to read. Sure, it’s fine and good for later at night. 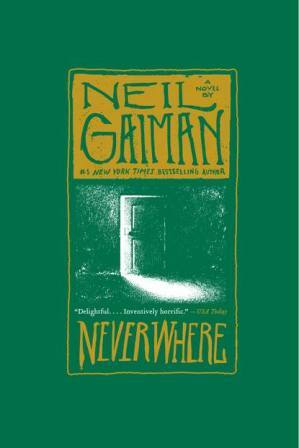 Neverwhere is actually my favorite Gaiman novel, and if this one left you unimpressed then the others will disappoint you a great deal more. I wasn’t nearly as dissatisfied with Neverwhere as Peter was; I actually was quite sold on the protagonist Richard Mayhew and particularly on how he was affected by the dissolution of his marriage and his discovery of and infatuation with the Lady Door. I think a lot of us feel unfulfilled with our lives and wish we would stumble upon an adventure, as Richard has done, that will allow us to ennoble ourselves and discover meaning through heroism. But what I enjoyed most of all was the world that Gaiman created here. For me, the world itself was delightful and refreshing enough. It didn’t leave me feeling unfulfilled or disappointed in the least. If you really want to feel ripped off, I’d encourage you to read Gaiman’s American Gods, which really never takes off and makes you wish you could get a refund on those four hours or so that you spent reading it. Knowing what Gaiman is capable of, the editors of American Gods should never have let that doorstop go to press. Oh dear, and I was going to try American Gods next, based on its reasonably good reputation, and on my general principal … inconsistently applied, I admit … of not-half spanking an author in public without giving him or her another chance. Also, I can’t say I was dis-satisfied with the book, but more not as satisfied as I hoped or expected to be. Part of the problem may be that I am not the ideal reader of the fantasy genre. I’m happy for the worlds to be fantastical. But I’d like the novels to deliver like they were written by first-tier artists, which may not be part of the author’s plan. I’d recommend his The Graveyard Book (I think that’s the title) as another good one to try. It’s loosely based on Kipling’s The Jungle Book, except that instead of being raised by wolves the protagonist is raised by ghosts. Very well done. Let us know what you think of that one!